BeerViking: Public omnibuses, in the land of the car? Yes – and A-very fine beer too! Public omnibuses, in the land of the car? Yes – and A-very fine beer too! 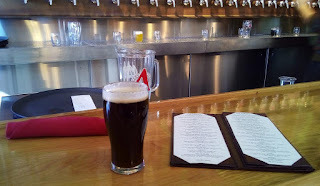 Part 2 of my touring Boulder's breweries and brewpubs, back in October. Part 1 is here. I think I must have visited Boulder's Avery Brewing Company 10 years ago on a pre-festival breweries tour ahead of the Great American Beer Festival. My memory's a bit vague, but I have a recollection of a typical “microbrewery in an large garage” type of set-up in a generic industrial unit. If I remember rightly, what made it different from the others we visited was it did sour and barrel-aged beers at a time when those were far from fashionable. Anyway, somewhere along the line they got my email address and have been dutifully sending me their monthly newsletter for pretty much an entire decade. I almost unsubscribed a couple of times, but then a few weeks ago I was glad I hadn't done, because they invited me (and presumably a few hundred others) to a launch party and a free pint of this year's 8.3% Old Jubilation winter ale. And for the first time in a decade it was going to be while I was not only on the right continent, but in the right town! So after a bit of breakfast, it was into town to find the bus station. Yes, pretty much every US city I've been to has a viable public transport system – if you're willing to put in the effort needed to figure out how it works in terms of fares, stops, etc. It helped a little that Boulder comes under the Denver Regional Transportation District (RTD), and I'd used Denver buses in the past, but really it wasn't that hard to scope out the routes on Google Maps, check the RTD website for timings, and so on. Asher Brewing Company's main claim to fame is that when it opened in 2009 it was the first all-organic brewery in Colorado – I presume there's been others since then. 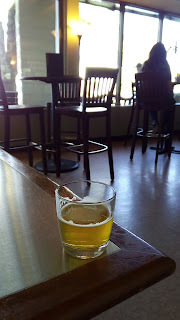 Tucked away among workshops and offices, the taproom was cool and bright, with at least half a dozen beers on draught. It was an unusual mix of a clean space with cheerful service and a sense of activist grunge. I liked it, but I can see it wouldn't be to everyone's taste. The beers were certainly well made, the best being the Green Bullet IPA which had a nice balance of chewy dry-sweet malt and aromatic hoppy bitterness. The others I tried – I had a flight of six tasters, including a properly (but not overly) bitter Kölsch and a chewy Double IPA – were almost as good. The one exception was a slightly insipid and over-gassy brown ale. From there it was a short walk back to Avery, where there was already a small crowd on the terrace outside the bar. As I walked up, I had to marvel a little at the purpose-built structure in front of me – it combines brewery, packaging plant, barrel ageing stores, restaurant, bar, shop and of course offices, and it's hard to imagine that it had only been in operation for eight months. The bar was already getting busy, even though it was the middle of Monday afternoon, but I was able to get a seat at the bar. The gimmick for the Old Jube launch was you had to wear a sweater to claim your pint – it being sunny and pretty warm outside of course – and there were several on view besides mine. I wouldn't normally start an afternoon session with an eight percenter, but hey, needs must… I just had time to enjoy the rich and lightly toasty brew, with its hints of toffee, cola and apple, before heading upstairs to join one of the regular free brewery tours. More on that in the next post in this series….